The Nginx web server, which has been adopted by a growing cadre of web sites in its open-source form, is now going commercial with a new NGINX Plus release. The commercial version wraps new features including advanced monitoring, application health checks and dynamic configuration and management around a service level agreement (SLA), said Nginx Inc. CEO Gus Robertson. The price is $1,350 per instance per year. Robertson said the company, with development in Moscow and commercial operations out of San Francisco, will continue to enhance the open-source version, but it was time for to take the next step. Nginx Inc. was founded 2 years ago and raised $3 million in funding in a Series A round in 2011. Robertson, a former Red Hat(s rhat) executive, joined the company in April with an eye towards getting a commercial release out the door. 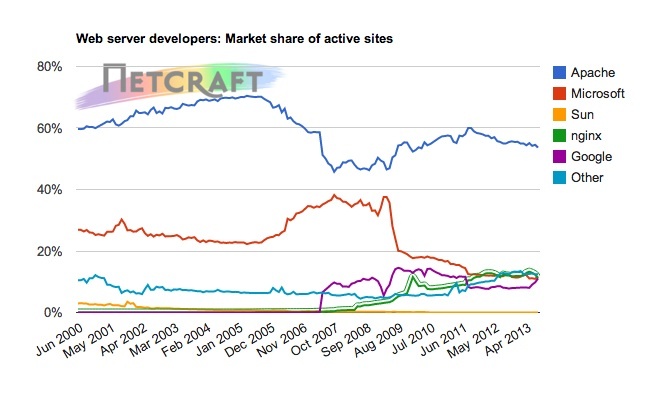 While Nginx is on an upward trajectory, challenging Microsoft IIS for the number two spot in market share, according to Netcraft data, it still has a way to go to beat out Apache.